OK, so what the heck are we to make of this Mariners team, and its absurd start to the 2019 season? We’ve never seen anything like it – and in a literal sense, that’s an accurate statement. No team in history has hit more home runs in its first 12 games. No American League team has scored more runs over the first dozen games since 1932. If you go down the “on pace” road, you’re going to get silly numbers up and down the lineup. Or does 257 runs batted in for Domingo Santana seem reasonable to you? But the shock value goes well beyond the raw numbers. I don’t know that I can ever recall such an unexpected flip of the script. 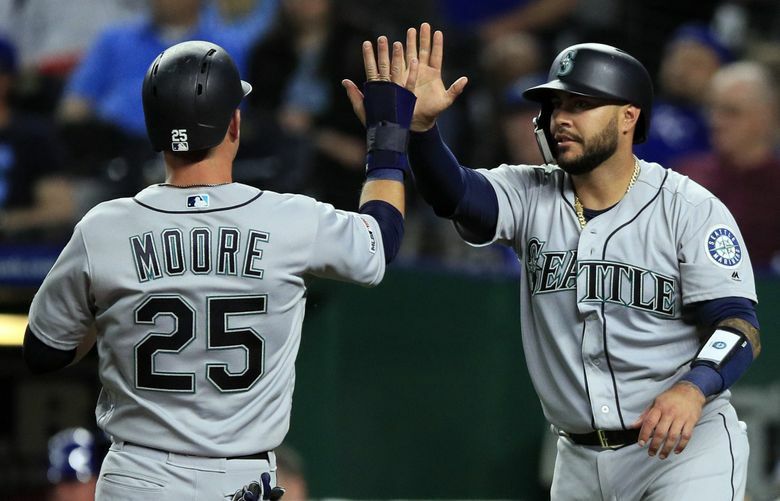 What the Mariners have done, bludgeoning opponents on a nightly basis to roar to the best record in MLB entering Tuesday’s games, in a season that was supposed to be about everything BUT winning – well, it’s stunning. Of course, this blistering pace is unsustainable. But that’s not the pertinent question anymore. The real conundrum is, have we seen enough to think that the Mariners can they actually contend in a would-be rebuilding year? It’s kind of a Catch-22, in a way. I think part of Seattle’s early success can be attributable to the mental freedom that comes with facing no expectations. There’s also the edge that comes with the cumulative desire to show that the forecasters are wrong. Once people start to jump aboard the train, well, a new kind of pressure develops. And it’s a naïve question, in the sense that 13 games (entering Wednesday) is such a drop in the bucket of the expansive 162-game season – eight percent. I learned long, long ago to not read too much into the waves and surges of April. Finally, it’s a loaded question as well. When the offense returns to mortality, the Mariners still will have a suspect defense and a vulnerable bullpen that could turn all this early success into a mirage. Among those watching all this with an especially keen eye is the architect of this Mariner rebuilding plan, general manager Jerry Dipoto. The early returns on his offseason handiwork are almost all positive – phenomenally so, for the most part. Dipoto’s goal in transforming the roster this winter was to put the Mariners in position for long-term success while accelerating the down time. Virtually every offensive acquisition is making major contributions, from Santana and his 19 RBIs to Tim Beckham and his .400 average, Jay Bruce and his seven home runs, Edwin Encarnacion and his 1.090 OPS. And Daniel Vogelbach, a Dipoto favorite since he acquired him for Mike Montgomery in a trade that has been mostly panned, is having the breakout many thought would never come. “He hasn’t thrown away a single at-bat since we left Peoria,” Dipoto said. Dipoto has revamped the Mariners while simultaneously fortifying a farm system that used to rank near the bottom of prospect lists. Now there is intriguing talent up and down the minor leagues – and at the major-league level as well. “I don’t know how you can watch what this team has done for 12 games and not be intrigued,” he said. Dipoto is well aware of the pitfalls. If you want to play the “on-pace” game, you have to throw in the 230 errors, right along with the 432 homers and 1,323 runs. And with closer Hunter Strickland out at least two months because of a lat injury, the Seattle bullpen remains highly susceptible. But Dipoto also sees the defense stabilizing once Kyle Seager returns to take over third base. And he sees help coming for the bullpen from the disabled list, where Strickland, Sean Armstrong, Gerson Bautista, Sam Tuivailala and now Chasen Bradford all reside. The Mariners entered this season with a plan that pointed toward all their talent coming to fruition at some point in 2020. Dipoto can’t help but wonder if that was a conservative estimation, at least with the lineup. Dipoto, however, says he will wait and see where the season takes them. He is a believer in the axiom that you use the first 60 or so games to assess your ballclub and react accordingly. The Mariners came into this year with a detailed plan of action, and Dipoto is not ready to abandon it on the basis of a flashy start that hasn’t yet reached two weeks. But he’s also open-minded about addressing glaring needs that continue to reveal themselves. But the Mariners won’t start dumping prospects, he promised. And for now, he has no plans to touch the veterans who were assumed all along to be trade chips. That list surely includes Encarnacion and Bruce, both of whom seemed to be on borrowed time in Seattle when the year began. Dipoto has insisted all along that the Mariners were not in tank mode this year, and that he felt they would be more competitive than people realized. He adds that in spring training, other general managers he talked to were much higher on the Mariners’ offensive potential than analysts and perhaps their own fan base. But he also knows that 13 games do not make a season – as spectacular as the first baker’s dozen have been. However, the Mariners have at least provided some hope – and entertainment — in a season that some felt would be devoid of it.